MOOR SPA®: SUBLIME BODY TREATMENTS! CAN'T GO TO THE SPA... LET THE SPA COME TO YOU! Moor Spa'scomprehensive face, body, spa and wellness line is inspired directly by the healing powers of nature. All products contain the exclusive Austrian Moor, a nutrient rich plant/flower/herbal complex that enhances skin's health and appearance. By combining the revitalizing, purifying Moor essence with plant derived cosmeceuticals, unadulterated herbal extracts and pure essential oils, Moor Spa delivers safe and effective solutions to meet your skin and body care needs. Products are not 95% or 99% natural, they are 100% naturally derived. Moor Spa is designated as a "champion" by the Environmental Working Group* (EWG) for its dedication to product safety. Unlike many products which claim to be natural, Moor Spa is completely free of synthetic preservatives, parabens, sulfates, artificial colours and fragrances, and petroleum-derived chemicals such as PEG, propylene glycol or mineral oil. The source of every ingredient that we use is listed in a 100% Natural Source Guarantee for each product. Created by nature over 10,000 years ago, this nutrient-rich complex is derived from a multitude of herbs, plants, and flowers and is revered for its therapeutic properties by both medical clinics and spas around the world. Every Moor Spa product contains the unique Moor essence. This consists of a wide array of organic substances and minerals such as humic acid, fulvic acid, anti-oxidants, proteins and mineral salts that enhance the skin's overall health. 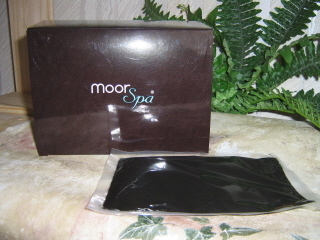 Moor Spa products are freshly produced with integrity and care, and delivered in hygienic and elegant packaging. - Active Ingredients that regenerate skin cells, increase circulation and detoxify the skin for a healthy, youthful appearance. - Advanced Cosmeceuticals help reverse and prevent the environment damage that accelerates aging of the skin. - Herbal Extracts to address common skin concerns such as eczema, psoriasis, acane, irritation due to cosmetic procdures, stretch marks, and cellulite. Beeswax candle not included, it's offered elsewhere! Combining Moor Water with extracts of Hops - Rosemary - Nettle, and Gotu Kola! Massage shampoo into hair and scalp for one full minute. 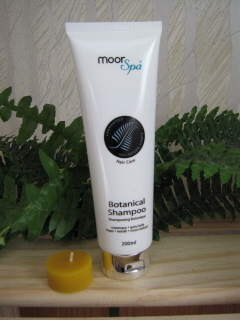 This is a Sodium Lauryl Sulfate-Free shampoo containing Moor and Botanical Extracts. Hops Extract: Beneficial for restoring balance to hair. Nettle Extract: Anti-Inflammatory properties and known to be an excellent hair revitalizer. Gotu Kola Extract: Revitalizes scalp by stimulating blood flow. Top notch hair shampoo - all hair types! This shampoo is a gentle sulfate-free cleanser that combines Moor water with a blend of Herbal Extracts for shiny, smooth hair. Professional & Home Use. - Sulfate-free with Moor - and Botanical Extracts. - Hops Extract - Beneficial for restoring balance to hair. - Nettle Extrct - Anti-Inflammatory properties & known to be an excellent hair revitalizer. - Gotu Kola Extract - Revitalizes scalp by stimulating blood flow. MOOR HERBAL BATH: Black Mud with Black Mud consistency! BOX CONTENTS: 5 pouches of Black Moor Herbal Bath. When added to your bath, the water-soluble nutrients in the MOOR are able to penetrate deeply - creating a wonderful soothing effect for the whole body. Take a MOOR BATH whenever you feel physical discomfort or imbalance. - Used in clinics throughout Europe as an aid in the treatment of many chronic conditions including arthritis, muscular aches and pains, psoriasis, fibromyalgia, and many more.
. Used in clinics throughout Europe as an aid in the treatment of many chronic conditions including arthritis, muscular aches and pains, psoriasis, fibromyalgia, and many more. May be used safely in hydrotherapy tubs and jacuzis - flushing out jets after use. A wonderful treatment for the whole body. Can also be used as a facial mask (instructions included) - must be kept tightly lidded. This 100% pure moor mask is unsurpassed in quality - and has been used extensively in europe for both wellness - purification - and as part of anti-cellulite - and weight loss programs. - Used for wellness, detoxification - and part of anti-cellulite and weight-loss programs. - Contains over 100 herbs, plants & flowers - plus a multitude of organic and inorganic substances. - Key component is HUMIC ACID - powerful anti-oxidant, cellular regenerator, anti-aging. For Professional & Home Use Applications. The famous Moor Herbal Bath... is one of nature's truly luxurious treats! When added to your bath, the water-soluable nutrients in the MOOR are able to penetrate deeply... creating a wonderful soothing effect for the whole body. 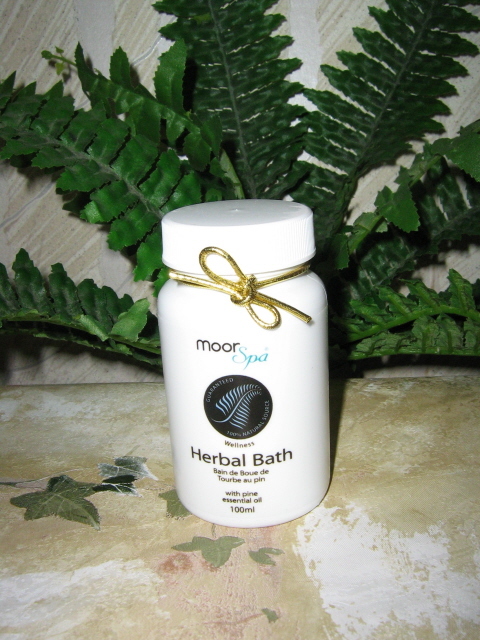 Take a MOOR BATH whenever you feel physical discomfort or imbalance. - Used in clinics throughout Europe as an aid in the treatment of many chronic conditions... including arthritis, muscular aches and pains, psoriasis, fibromyalgia, and many more. Run a warm bath - stir in - as needed - up to 100 ml of the Moor Bath. Make sure that the bath is not too hot (maximum 38 C). Very hot water can cause excessive perspiration and fatigue. Relax in the bath for up to 20 minutes. After the bath, do NOT rub down... but wrap the body in a large towel and lie down for one hour in a warm room. When draining the moor bath, stir the water periodically to ensure that no residue is left in the bath. Residue, if any, should be picked up and discarded. May be used safely in hydrotherapy tubs and jacuzis - flushing out jets after use is strongly recommended! Manual exfoliation is recommended prior to taking a moor bath. Aqua - Moor (Heilmoor Clay) - Pinus Sylvestris (Pine) Oil. PRICE: C$33.00 - 200 ml / 7.1 fl.oz. A light, premium-quality blend of Moor Water and exquisite oils including Jojoba and Wheat Germ. Ideal for bodycare and superb for all cosmetic purposes! This oil is non-greasy and very quickly absorbed. 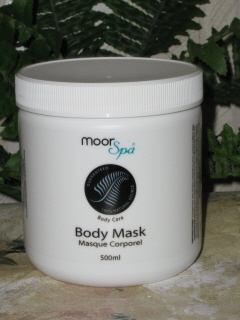 Use as a skin preparation prior to application of either MOOR BODY MASK or FACIAL MASK. Not suitable for body massage due to its fast absorption. Also use for blending with the Salt Glow. Apply a few drops on tired or dry skin. Aqua - Glycerin - Simmondsia Chinensis (Jojoba) Oil - coco Glucoside - Sodium Stearoyl Lactylate - Heilmoor Clay - Triticum Vulgare (Wheat) Germ Oil - Sodium Carboxymethylcellulose - Cyamopsis Tetragonoloba (Guar) Gum - Hydroxypropyl Starch Phosphate - Arginine - Citrus Grandis (Grapefruit) Oil - Lavandula Angustifolia (Lavender) Oil - Citrus Aurantifolia (Lime) Oil - Silver Citrate - Citric Acid. - Emulsion of high grade plant oils and Moor Water. - Used as preparation for MOOR BODY WRAPS, co-ingredient for Salt Glow, and can be used on its own for intensive moisturization and skin revitalization. - Wheat Germ Oil: Natural source of Vitamins A, D, and E.
- Jojoba Oil: Has natural affinity to skin, helps restore elasticity and smoothness. MOOR SPA - LIP BALM: 100% Natural - contains Moor Peat! This Lip Balm is 100% Natural - consisting of the MOOR PEAT in powder form, in a base of sweet almond oil, beeswax, cocoa buter, and shea butter. Moisturizes, protects, and nourishes the lips and the delicte skin of the surrounding area. - Contains MOOR PEAT (in powder form) in a base of Sweet Almond Oil. - Cocoa Butter; Softens and lubricates the skin. - SHEA BUTTER - Soothes and softens. - Sweet Almond Oil: Moisturizing with emollient properties. - Peppermint Oil: Fresh taste and scent - has a cooling feel. A 100% natural herbal health supplement consisting only of the herbs, organic substances, and trace elements of the Austrian Deep Moor. Gently pasturized consisting of Moor and the Moor Water. When mixed it is virtually odourless and tasteless. The "Herbal Bouquet" (as it is known in Europe) helps to enhance your vitality and maintain your inner health. One teaspoon is stirred into any liquid 1 to 3 times per day, half an hour before meals. - 100% natural herbal supplement - gently pasteurized). - Contains hundreds of herbs, organic substances and trace elements. - High bio-available (easily assimilated by the body). - Enhances one's vitality and detoxifies. AUSTRIAN MOOR SPA: Till end of September 2017 : 15% Saving on all products!